Another casualty of WW1 was George Henry SOUTHGATE who worked as a porter at Aldeburgh for the Great Eastern Railway, originally joining them at his home town of Woodbridge in February 1912. He enlisted with the Suffolk Regiment, 4th Battalion in June 1915 as Private 3577. He was killed in action on 18 August 1916 aged 22 and is commemorated on the Thiepval Memorial. A subscription supper to the employees of the Aldeburgh Branch Railway was given on Saturday evening, at the Railway Hotel, when a bountiful meal was provided by Mrs. Wells. With toasts, speeches, and songs, a most enjoyable evening was spent. The 5.22 p.m. train from Saxmundham to Aldeburgh, due at Aldeburgh at 5.45 p.m., and composed of tank engine No. 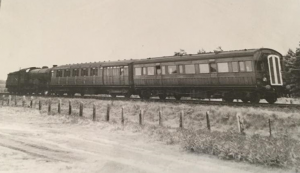 25, one composite carriage, two third class carriages, and the guard’s break-van, left Leiston on Saturday at the advertised time with about 28 passengers. As the train ran into Aldeburgh Station several of the passengers remarked that they appeared to be going too fast, and that no whistle was sounded. Persons near the station also noted this fact, and saw the guard’s van skidding under full break, and fire flying from the wheels. Just through the arcade which covers the station a spare composite carriage was standing near the buffer stops, adjoining the fence and roadway. The train, with apparently undiminished speed, dashed through the arcade, past the station, and, colliding with the spare carriage, drove it and the massive buffer stops quite across the road, and within a few inches of the low wall fronting York Villas, the buffers of the carriage being, strange to say, within about four feet of the front door of the house where the regular engine driver lives. The engine itself was partly buried under the end of the carriage, and went some feet into the roadway, whilst the following carriage marvellously escaped telescoping, being merely buffer-locked. The passengers fortunately escaped with a slight shaking, but a pumper named Fryer, who was riding on the engine, is said to be somewhat injured. The train was run by a certificated fireman named Hughes, who, together with his fireman, states that the break was applied at the proper time, but that it failed to act. Hughes is suspended pending an inquiry into the matter. A somewhat remarkable escape occurred in connection with the accident. Just before the spare carriage was forced through the fence, two little girls were looking through at the approaching train, and the fence in falling arched over them quite close to the carriage. One of the girls was for the moment unable to extricate herself, but the other pluckily caught hold of her sister’s arm and fairly hauled her out, neither of them appearing very seriously alarmed. The highway being completely blocked, it was necessary to speedily clear a crossing for road traffic elsewhere, and this was soon done by Mr. Taylor, the stationmaster, who had previously wired to Ipswich for a breakdown train and gang. Meantime, about eight passengers wanting to go by the 7.0 p.m. were forwarded on to Leiston by Mr. Ball’s ‘bus and other conveyances. The break-down train and gang arrived at 9.15 p.m. in charge of Mr. J. Flower, district superintendent, who was also accompanied by Mr. Johnstone, district engineer, and Mr. Robinson, locomotive district superintendent. Soon all was activity, and by the aid of two very ingeniously constructed camp-fires, the gang proceeded to remove the obstruction from the highway, and to re-place the engine and carriage upon the metals. This was, of course, a work of time, but the quiet energy of the men, under the able supervision of Mr. Flower and the other officials, shewed that even greater difficulties might be surmounted if necessary. Crowds of people were present watching the proceedings with considerable interest, and many of them stayed till the small hours of the morning. The engine was got on the rails about 3.0 a.m. and placed in the shed ready for work again yesterday (Monday), being found to have sustained little or no injury. The highway was cleared at 4.0 a.m., and at 5.30 a.m. the breakdown train and gang, in charge of Mr. Flower, returned to Ipswich. Yesterday (Friday) morning, as the 7.5 a.m. up train was leaving Aldeburgh Station, the engine left the metals at the points near the ticket platform. Fortunately no great velocity had been attained, so that the damage done was merely the disarrangement of the permanent way. It, however, took four hours’ hard work, with all available help, to put the “iron horse” on his road again. The excellent train service of this Company has of late given universal satisfaction. This month, however, the 7.5 a.m. (branch) up, and the 8.5 a.m. ditto down trains, were advertised to run only on Mondays. One gentleman of the district, not to be done, wired at once to the officials as Liverpool-street, with the result that both trains were ordered to run as usual on the Tuesday morning. OFF THE RAILS. – Yesterday (Friday) morning, as the 7.5 a.m. up train was leaving Aldeburgh Station, the engine left the metals at the points near the ticket platform. Fortunately no great velocity had been attained, so that the damage done was merely the disarrangement of the permanent way. It, however, took four hours’ hard work, with all available help, to put the “iron horse” on his road again.